Another month come and gone – I can’t believe it’s officially summer and I just had my birthday! But, the close of another month means another Foodie Pen Pal recap! This month I received my box-o-goodies from Maria over at Lil Mys Ninja, who is also into food and fitness. After checking out her blog, I knew I’d be receiving some awesome treats! The box came as they always do, waiting for me on my doorstep after a long day of work. When I opened the box, I was greeted with a sweet little note – how cute! When Maria first e-mailed me to get my information, she asked if I preferred salty or sweet, healthy, etc. I felt silly responding that I like it all, but it’s true! SOmehow she was able to give me just the right amount of everything, and it was all new to me except for the Justin’s Nut Butter, which I love. I joke that their chocolate hazelnut butter is magical. I always buy the packets because I have no self control, and they prevent me from eating the entire thing. I also got a new-to-me larabar flavor, blueberry pie, which was awesome. I’m yet to meet a larabar I don’t like! There were also some completely new treats, including some Back to Nature crackers, fruit leather, a granola Powerbar, a Zone Perfect bar , and a Power Crunch bar. I think the Zone Perfect and Power Crunch bars were my favorite, probably because they tasted like dessert! I’m always weary of “health” food bars, usually because the ones that taste good are high in calories, and the rest really aren’t that good flavor wise. So I was pleasantly surprised that these bars actually taste like they say they do. There was also a bar of dark chocolate, which is always a favorite of mine. I was bummed when they were gone, but that just means I’ll have to go get some for myself! I couldn’t be happier with the goodies I received this month, which is evident by the fact that I barely have anything left! I’m bummed I won’t be able to participate in July, but hopefully I’ll find my own yummy treats while on vacation. Thanks again for the goodies, Maria ! I can always tell just how quickly time is passing when I have to sit down to write another Foodie Pen Pal post. I joined the fun back in December, and have been loving every minute of it since! The idea of getting to put together a box of goodies and exchange with people who also love food and blogging is right up my alley. I’ve yet to be disappointed with anything in any of the packages I’ve received, and usually devour everything. This month’s box came from Emily over at The Last Corral. Emily asked if there was anything that I liked/didn’t like, and I mentioned my affinity for chocolate. Well, she didn’t skimp and sent me quite a few goodies that had chocolate in them! To balance out the chocolate, there was also some healthy stuff, but you know what I went for first! Emily also included some healthier options, like the berry edamame blend and two KIND bars. I’ve actually never had a KIND bar, and I’m not sure why – I seem to always pass them by in the aisle at the store. But not anymore – these things are delicious! I wasn’t sure how I was going to feel about the almond & apricot simply because I’m not a big apricot fan. This bar didn’t taste like the dried apricots I remember from my childhood, but instead it was fruity and tropical. The fact that there were full-sized almonds in the bar was also a nice change of pace. I knew I’d be in love with the almond & coconut bar, and it didn’t disappoint. It had huge chunks of coconut, and again the whole almonds. They were SO good and I can’t wait to get more. I’m really glad Emily introduced me to them! Thanks again to Emily for the goodies – I loved them all! Every month, I feel like I hit the jackpot when it comes to my Foodie Pen Pals package. February was no exception, and since I got my package nice and early, I’ve had the opportunity to sample almost everything that the wonderful Mellissa from A Fit & Spicy Life sent me. It’s as though Mellissa read my mind when she sent me Target’s Archer Farms granola. My absolute favorite is the chocolate chunk hazelnut biscotti, so I was beside myself when I saw that was included! I also got to try the pecan sticky bun, and that is definitely a close second favorite. These granola goodies were just in time, since only a few days before I finished my Pure Bliss Eats peanut butter chocolate chip granola. Now I’m itching to take a trip to Target and grab a full sized box of each flavor! Since I’ve been teaching, granola bars for breakfast have become my new best friends. Naturally, seeing a box of blueberry almond flax bars got me excited. I enjoyed one every morning last week, and am looking forward to checking out what other flavors they have (while getting more granola, of course). While I was a little wary of the black currant chocolate, I was pleasantly surprised when I had a taste – it’s a nice balance of fruity sweet with chocolate – I’ll be taking my time to finish off that bad-boy. The “Monster” trail mix has also been a great afternoon snack to help get me through grading essay after essay. My 11th graders are taking the HSPAs next week, so we’ve been all about practicing expository, open ended, and persuasive writing. Nuts and chocolate are the right kind of pick me up for that! While I haven’t tried the Mio yet, every single time I see it, myself and my husband start singing the commercial jingle… who would have thought Foodie Pen Pals could bring music to the home! I also haven’t tried the Gatorade energy bites, but I’ll have to report back after I devour some pre-run. I’m so thankful for all the goodies Mellissa sent me, and if you’re interested in finding out what I sent this month, head over to Linday’s blog It’s Linz to check it out! 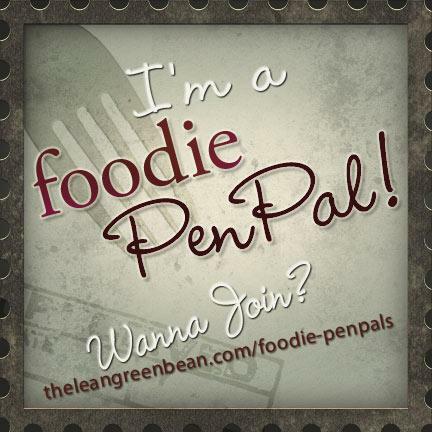 Thanks to a post by Megan, I learned about Foodie Pen Pals a few weeks ago. After e-mailing the wonderful host Lindsay, I was in on the fun and couldn’t wait to give and receive some goodies. The idea is pretty straight forward – you are then randomly matched up with fellow bloggers to exchange a foodie package with monthly. The spending limit is $15, and you can send them whatever you’d like – of course checking with them first for any preferences, restrictions, or allergies (see below for details on how to join in!). It was so exciting to come home from work last week and see a package for me I could actually open right then. Up until that point, everything waiting for us on our door step was either something I ordered as a gift for someone, or a gift my husband ordered for me, that I couldn’t see! I received quite the package from Ashley over at Southern Purple Vegan. I couldn’t wait to devour everything in my package, but I had to wait long enough to take a picture of it all first. My goodies included maple and hazelnut Justin’s Nut Butter, two packages of ground flax, spicy popcorn, a Texas shaped lollipop and cookie cutter, a larabar, a Pure bar, a little trail mix, some Emergen-C, and vanilla pepper. Ashley really hooked me up! I love Justin’s nut butters so that was an awesome surprise. The vanilla pepper is so interesting I can’t wait to use it in some dishes instead of black pepper. We also have a bottle of Dave’s hot sauce, so I can’t wait to try the hot sauce infused popcorn – my husband is going to be all over that. I also love the little travel packets of flax – I have huge bags of flaxseed, but that requires grinding to use it in most dishes (unless I’m throwing it in granola), so I’m excited to try that. I already devoured the larabar, and it didn’t disappoint. It blows my mind how few ingredients they use, but how flavorful those little bars are. So I guess you could say I’m extremely happy with my treats! My package went to Karen over at The Tamale Girl. You’ll have to head over to her blog and check out the goodies I sent! I would highly recommend joining in – it’s nice to come home to a package of handpicked goodies from a fellow blogger and food lover! See below for details.